Former Egyptian President Hosni Mubarak has been ordered back to prison from military hospital. 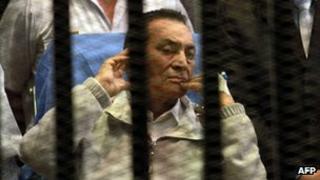 Mr Mubarak's retrial will open on 11 May, a Cairo appeals court says. He is charged alongside his former interior minister and six former security chiefs with complicity in the murder and attempted murder of hundreds of protesters in January 2011. The retrial was meant to begin on 13 April but collapsed when the presiding judge withdrew from the case. AFP news agency quotes judicial sources as saying that Judge Mahmud al-Rashidi will preside over the case at the North Cairo Criminal Court. Mr Mubarak will also face a retrial or corruption charges, along with his sons, Alaa and Gamal, and businessman Hussein Salem. They were found not guilty the first time round. Mr Mubarak was convicted last June of conspiring to kill protesters during the 2011 revolt. He was sentenced to life in prison. January 2013 - Retrial is ordered because of "procedural failings"
However, a retrial was ordered in January after he appealed against the sentence, with the court citing "procedural failings". The retrial began on 13 April, but presiding Judge Mustafa Hassan Abdullah withdrew immediately, stating his "unease" about reviewing the case. On Monday, a court ruled Mr Mubarak could no longer be held in prison on the charges related to the killings of protesters. His lawyer successfully argued that he had spent the maximum time in prison under temporary detention. However, he remains in custody on the corruption charges. The former leader has been in poor health since his arrest and appeared on a stretcher during his first trial and at the 13 April hearing. About 850 people were killed in the crackdown during the 2011 uprising that ended Mr Mubarak's rule. Deaths during the uprising were largely blamed on the police at the time, but a recent leaked report implicated the army in serious human rights abuses, including the killing and torture of protesters. The leaked chapter, reportedly presented to President Mohammed Morsi late last year, contains testimony relating to civilians detained at military checkpoints who were never seen again and reports that the army delivered unidentified bodies to coroners. Egypt's Defence Minister Abdel Fatah al-Sissi denied the accusations, calling them a betrayal.